Look no further than Beer City Glass for all of your aluminum can needs! From small quantities for your seamer, to large runs on your canning line, we can provide brite, pre-labeled, or shrink sleeved cans, cased-packed or bulk. We stock cans from 8-32 ounces. Call us today for details! Beer City Glass is now providing pre-labeled Crowler cans, case packed and in quantities that are easy to manage! 8, 12, 16, and 32 oz! We provide it all, easily case packed and ready-to-go! Click through to learn more about how we can save you time & money! 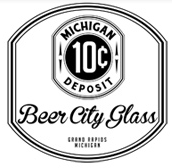 At Beer City Glass, we specialize in printed and etched growlers and barware, stainless steel, and plastic containers. Our customers are breweries and homebrewers, distillers and wineries, bars and restaurants, coffee shops, root beer stands, chemical product manufacturers, and anyone looking for great service, quality products, and fair pricing. Screen Printed Apparel, and more! We're printing apparel, and more now! Contact us today to discuss what t-shirts or other wearables we can create for you. We can also do can koozies, and baseball hats! If you have a need for other items you want your logo on, let us know! Competitive Pricing, Quality Workmanship! Promotional products just waiting for your brand! Whether you are looking for a specific item or just browsing for ideas, our site is your one-stop shopping source. From fun items to the traditional, you can easily search for some of the hottest items on the market, and we are here for you 24 hours a day! One of the most trusted brands for over 100 years has adapted to the 21st century and have created many types of beer, spirits, and hydration containers. And we now have them available to you for laser marking and engraving! Check out our custom etching! Beer City is your source for personalized etched glassware and growlers. Perfect for that unique holiday gift, corporate event, mug club, or just to show off your logo. At Beer City Glass, we’re experts at decorating your glass, stainless steel, ceramic and plastic containers through cutting edge and environmentally safe technology. We’re screen printers at heart, so let us bring your brand to life on any number of products, from one, two, three or more colors we’ll make your brand pop off whatever it’s printed on! From one of a kind gift’s, to mug clubs, to bar mirrors our etching options are awesome! From one glass to thousands, you will love our etching services! Whether you are looking for a specific item or just browsing for ideas, our site is your one-stop shopping source. From fun items to the traditional, you can easily search for some of the hottest items on the market, and we are here for you 24 hours a day - 7 days a week. Quickly and easily search our vast database of products for items to improve traffic at trade shows, motivate staff, thank a customer, and more! From small runs to high volume projects, expect the same attention to detail and personal interaction at each step along the way. Hit us with your ideas and lets create some art together! We Design and Decorate For You! Screen printed growlers, glassware, stainless steel and powder coated bottles, ceramics and plastics of all kinds. Etched glassware and stainless steel / powder coated growlers, bottles, and mugs. Mug club etching from 1 to 1000 and up! Custom wood and stainless steel tap handles. Printed and etched store merchandise from key chains to bottle openers and beyond. Custom one of a kind growlers and glassware, your design or ours. Perfect for weddings, home brewers, birthdays, or just for yourself. Beer mirrors that make an awesome gift and look fantastic behind the bar. Contract decoration for distributors, we will make you look great! And so much more – bring us your ideas and projects and we will make it happen! Whether it’s to create a fun new look for your business or a special one-of-a-kind gift, Beer City Glass has the products and experience to make your vision a reality. Give us a call at 616.482.0024, 0r 1.844.4BCGLASS and let’s get the process started today!